After our particularly unpleasant winter, The Summer Music Society of Saugeen Shores is offering you a huge, "out of this world" evening of entertainment and you choose how much to pay. On Saturday, May 4th, after four months of cold and blustery weather, come in to the warmth of the best concert venue in the entire area. 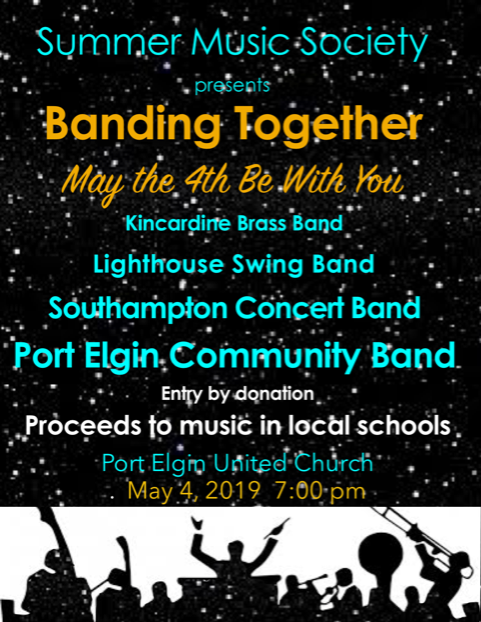 The Summer Music Society has organized a joint fundraising concert to maintain and assist school music programs in the communities where we live here in Bruce County. This webiste has been developed in a partnership between Port Elgin's BIA and Tourist Town Online Solutions. If you have further questions, please email Port Elgin BIA.